In 1887 Wallace R Wood was the first to patent a capo for the fretless banjo. In front of the capo there was thin metal yoke that worked as a fret. The strings were threaded above the fret/yoke and under the capo. Also the 5th string was capoed. It was threaded through a nut that could be placed in different sockets in the fretboard. Next year, 1888, Wood patented a sliding 5th string capo. The 5th string is threaded through a nut sliding on a rail. The sides of the rail are slanted and there is a dovetail joint between the sliding nut and the rail. The rail is fastened on top of the fretboard with screws. US patent 1889 by Ray Gill & Frank A Kilber. 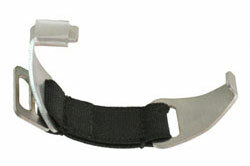 This capo could be removed from the instrument and was primarily intended for fretless banjos or banjos with flush frets. It's a movable nut that is slipped under the strings. The 5th string has a nut at the end of the adjustable rod. On each end of the bar there is a hook intended for a rubber strap around the instrument neck. According to the patent this capo was fastened either with a screw clamp or a rubber strap, but in this ad the clamp is obviously abandoned. These are the only patents of capos for fretless banjos. Now, let's concentrate on the 5th string. A clever way of capoing the 5th string of a clawhammer banjo, is to install one or two extra 5th string nuts in the fretboard. For clawhammer playing this makes the 5th string easier to pick because it is elevated from the fretboard. Carving away the upper part of the fretboard, as many clawhammer players do, becomes unnecessary. This works for fretless banjos too. To avoid buzzing, the 7th fret nut is placed aside and both the extra nuts are lower than the 5th fret nut. The 9th fret nut is lined up with the 5th fret nut, but note that 5th fret nut elevates the string to the same level as the other strings, allowing it to vibrate free above the 9th fret nut. To prevent the string from popping out of the groove in the nut when played hard, the string is slipped under the head of a small tack located at the fret behind the extra nut. The most preferred way to capo the 5th string is to slip the string under small hooks permanently installed in the fretboard. Installed correctly you won't notice them when you fret the string because they are lower than the frets. They add no extra width to the fretboard which is an advantage - specially when you fret the 5th string with the thumb. A slight disadvantage is that they require some retuning. "I used very small crochet hooks. I would get one with a very small shank and snip the hook off about 1/4" down he shaft and drill the board and install it. It worked well. Some have used hairpins bent with L shape and set into the board. I have seen small headed tacks put into the board and clip the fifth string under the head of the tack. When the HO-spikes came along, it helped us older boys out a lot." Janet Davis Acoustic Music has hooks for this purpose. Walt Pittman invented the sliding capo with a waved rail in the late 1950's. This capo is not patented as each one has to be made by hand to fit each banjo. One end is anchored around the shaft of the 5th string key under the button, the other end is screwed to the side of the fretboard. 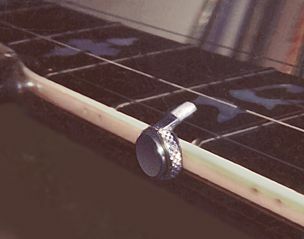 A small fretting hook is sliding along the rail, fretting the string when located on a thick part of the rail and passing the frets on the top of the waves. When not in use the hook rests behind the 5th string nut. If required the rail can be made slightly curved to compensate flexing. In the sixties Ode marketed a variation of the Pittman capo that was attached with a screw in each end. Walt Pittman designed another 5th string banjo capo. This one is more commercial, but I have not found any patent. It has a straight rail screwed to the side of the fretboard and a small spring sliding on the rail to fret the string. It was first marketed by Vega and is still marketed under different names. US patent 1974 by Richard Shubb. This capo also* uses a dovetail joint between the rail and the sliding fretting mechanism. The rail is screwed to the side of the fretboard and the fretting lever is operated by a screw making the string pressure adjustable. * See Wood's sliding capo from 1888 at the beginning of this page. This one has a round slide bar which is flattened on the outside. In action the round tip of the thumbscrew presses against the lower part of the flat side of the bar. Thus the down force on the 5th string is adjustable. Clever! When not in use the capo is fastened in the offset position. Made by Wouter Pothoven, Netherlands. More info at WP Strings. In his book How To Play The 5-string Banjo, Pete Seeger suggests a 5th string capo invented by songwriter Ernie Marrs. It was made out of a clock spring. The lower end hooked into a narrow groove dug in the back of the neck, exactly parallel to the edge of the fingerboard. Did anyone try it? Most likely inspired by the capo above, this 5th string capo was invented by Marc W Mauss, New York, in in the early 1960's. It is made out of a paper clip and hooks around the edges of the fretboard. Here is refinement of the paper clip with an elastic strap and a small handle. US design 2006 by Earl J Fowler. This one is home made by Per Svalander, Sweden. 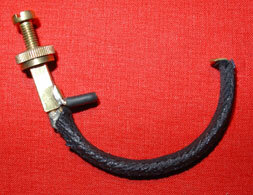 Soldered brass hardware with plastic and textile tubing. Small holes, about 1/4" deep, are drilled into the side of the fingerboard like you would for a position dot. The holes are drilled just behind the frets. 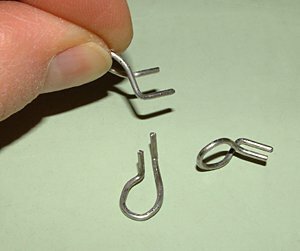 A small round piece of steel is bent into a U-shape. Insert it into the hole and then hook the 5th string under it. This long neck, aluminum Merlin banjo made in the 1960s utilises this idea. It is a little piece of springy wire. One end is flattened for slipping over the fifth string. For storage, one end goes into one of the little holes and the other end goes into one of the larger holes, parallel with the fingerboard. These have a loop handles and were made by Hans Holzherr, Switzerland. "Back then I made several because I knew that I would lose them sooner or later." Designed by Hans Holzherr, Switzerland. A truly unique capo! Only two capos were made by Peter Schild in 1982 or -83. On half of the perimeter the knurled ring had a varying thickness, changing the angle of the L-shaped lever as the ring was turned. Half a turn was required to bring down the lever on the string. The angled milling of one half of the ring made two 'steps' in the ring which acted as stops for the two extreme positions. The capo was inserted into two small holes at the side of the fretboard. The second capo only required one hole per fret. because it is lifted to the same level as the other strings. They both work on fretless banjos as well. A very simple way to capo the 5th string is to slip a short screw under the string just behind the fret. The head of the screw stops against the edge of the fretboard. The screw raises the string above the fret and works as a nut with the string resting comfortable in one of the threads. Remove the threads on one side to protect the fretboard. Make the end of the screw slanted to facilitate slipping the screw under the string and to make room for the fingers to fret the 4th string. If it rattles when played hard, put the string in a thread closer to the head of the screw. US patent 1995 by Gomer M Reagan. Janet Davis Acoustic Music have it. The ingenuity of man is fascinating. This one is made out off a pen cap, riding on the fret. Made by Bob Skluzacek, California. US patent 2000 by Stan W Riddle. A set of four removable capos (for fret 7, 9, 10 and 12) that attaches to the fifth string tuning peg. Made of spring tempered stainless steel. Custom lengths can be ordered. The capo is anchored around the string post, wrapped under the peg and placed upon the string. The washers are mounted on the shaft of the peg to support the capo sideways. No installment damages to the banjo neck. The capos are stored by the two magnets, e.g. at the brackets. Made and marketed by Tone Techniques LLC. Normally the 1st and 5th strings sound unison when you fret them at the same fret. Here is a trick with the 5th string capo that will open up for some new banjo sounds, particularly if you play in the melodic style. In standard G-tuning: Capo up the fifth string to the 8'th fret. Then tune it down all the way to its normal pitch. Now the 5th string will give you the same notes as the 2nd string when fretted on the same fret. Try it! Impossible phrases may become very easy to play.